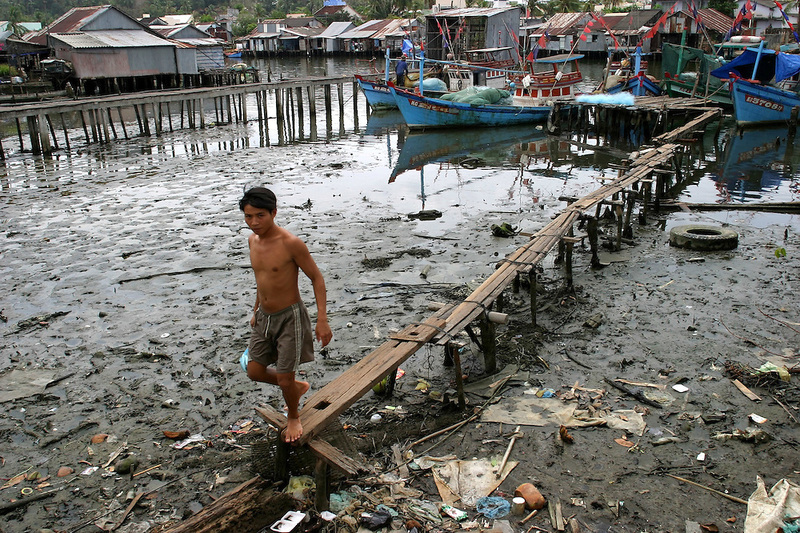 A man wallks along a narrow warf above polluted waters on Phu Quoc Island, Vietnam. Phu Quoc is Vietnam's newest beach destination, just a 50 minute flight away from Ho Chi Minh City. With its proximity closer to the Cambodian mainland than to Vietnam, it was a launching pad for thousands of "Boat People" refugees during the 1970s and 1980s, and has a strong military presence. However, with tourism in Vietnam booming, the government has opened up this largely agricultural and fishing island to foreign tourists, who can now enjoy sunsets on the only beaches in Vietnam that face west.